Tooth whitening or bleaching is a popular procedure to help make teeth brighter in appearance. Bleaching can be used to lighten discolored teeth and enhance a smile. Tooth whitening is a safe and painless procedure. If you experience sensitivity with whitening, just ask us for a lower concentration of bleach. We offer two methods of teeth whitening: Zoom In-Office Whitening and Take Home Bleaching Trays. 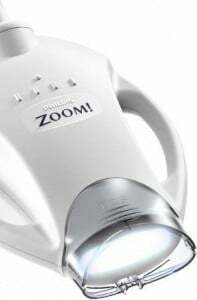 Zoom is ideal for anyone wanting brighter teeth immediately, making it the perfect choice for busy individuals and those needing quick results for events such as weddings, reunions, etc. The procedure takes place in our office and takes about one hour. A light-activated gel is applied to your teeth, and a special light is used to enhance the action of this gel. The result is dramatically whiter teeth lasting for years. We suggest using custom bleaching trays at home in conjunction with the ZOOM treatment to keep your smile bright for years to come. Bleaching trays are included in the cost of ZOOM in-office treatment. Take home bleaching trays are an effective, less expensive way to brighten and lighten teeth. These custom trays are made specifically for you; you can use these trays in the comfort of your own home to gradually whiten teeth. You can adjust the amount of time the bleach is in contact with your teeth depending on any sensitivity that you may experience. Typically, significant results are seen within two weeks. We provide full-service dental treatments for patients and their families in Winchester, Middletown, Stephens City, Stephenson, Berryville, Inwood, Front Royal, Martinsburg, and the Woodstock, VA (Virginia) areas.